When talking about bobber or float fishing most steelhead anglers assume we’re speaking about a jig under the float. In most cases this would probably be correct. The bobber and jig is extremely effective and popular. But, one method that often out produces a jig under a float is eggs under a float. First, jigs don’t fall off. Eggs of course, when used with any technique, will fall off or simply “run outta juice” and have to be replaced after a few drifts or floats. Then there’s the fact that eggs can be messy. Yep, no question there. When I fish eggs I usually get greeted with a “Take those clothes off” before entering my home. Myself along with my gear have suddenly taken on the color and smell of the eggs. Most times however, the real reason eggs aren’t as popular is due to regulations. If bait is not allowed then of course we can’t fish eggs. Meanwhile, when bait is allowed, why wouldn’t you fish eggs? They are uber effective if cured and fished correctly. Personally, I like pink. 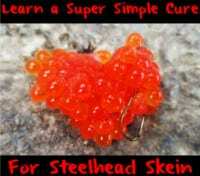 My steelhead eggs are cured with Fire Cure or Borx O’ Fire. I try and have some of both to see exactly what recipe the fish are looking for on any particular day. Eggs do fall off. However, some of that has to do with how many anglers cast and the size of their egg cluster. The larger the cluster the more resistance the eggs will have when casted, especially when delivering a backwards motion prior to letting it fly. When casting eggs I try and be as gentle as possible. Instead of whipping the line behind me I prefer to lob them thus letting the eggs and float land and gently as possible. False hooksets can tear the eggs off, too. Fortunately, smaller egg clusters stay on better and tend to be more attractive to steelhead anyway. This could be because they look more natural at least in my opinion. Since the eggs are semi buoyant to fish a bobber and egg setup properly it’s important to take into account how deep and where the steelhead are lying. For best results make sure your eggs (when hanging straight down) will be about one foot off the bottom. Keep in mind eggs aren’t weighted. They don’t sink as fast as a jig. Because of this you’ll have to cast further upstream from a hole or slot then you normally would. This ensures the eggs will sink into the strike zone by the time the reach the area the fish are in. Obviously, the buoyancy of eggs differs from a jig. The jig sinks whereas eggs swirl and move with the current. This is a good thing! The swirling action looks natural as anything unattached from a fishing line normally would. This natural look is what the fish want. Let them have it! How do I know eggs are more effective? Even though I’ve heard it from many experts I know from experience. To truly test a product, or a method against another, you have to fish often, be open to many techniques and have fish around. For example, a few years ago in the Skeena Region (British Columbia) we were averaging more than 20 fish a day so it was possible to switch techniques often to see what they preferred. Eggs under a float killed it by almost an 8 to 1 margin over jigs. And this is coming from someone who absolutely loves to fish jigs under a float. The setup is super simple. I’ll use my standard float fishing setup, either a G. Loomis 1262 with a Stradic 3000, loaded with 30lb power pro – or a G. Loomis 1352 Centerpin, Kingpin reel combo loaded with 10lb Maxima Ultra Green. I like a slip float system so I’ll have a bobber stop, a bead, then through the float (3/8 ounce) another bead, whichis then tied to a 1/4oz inline weight using a palomar knot. From the bottom end of the inline weight attach two-to-three to feet of 8-pound Maxima Fluorocarbon leader using a reverse clinch knot. I’ll then attach a #2 octopus style hook with an egg loop knot. You’ll want the eggs above the bottom by one-to-two feet. The longer the leader the more likely the eggs don’t reach the strike zone as effectively. The inline weight should be just off bottom. Due to the buoyancy of the eggs they will float just above the weight, but downstream due to the current. The lighter the leader the more “action” the eggs will produce by being able to free flow with the current. Jigs are still my “go to” method, only because bait is not allowed in most the areas I fish. But, when bait is legal nothing beats well-presented eggs, with the most effective method in my mind being under a float. 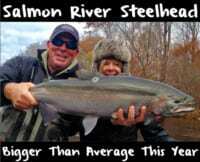 Editor’s Note: Owner of Steelhead University, fishing personality Terry Wiest is a well respected, award winning author who resides in the Pacific Northwest.